San Cassiano is a delightful village on the magnificent Dolomiti Superski area, well positioned between La Villa and Cortina, and close to Armentarola, with its famous horse-drawn ski-lift! A stunning array of dramatic Dolomite peaks provides an unforgettable backdrop to the incredible 1,220km of varied skiing, which is easily accessible from the resort’s main Piz Sorega gondola. 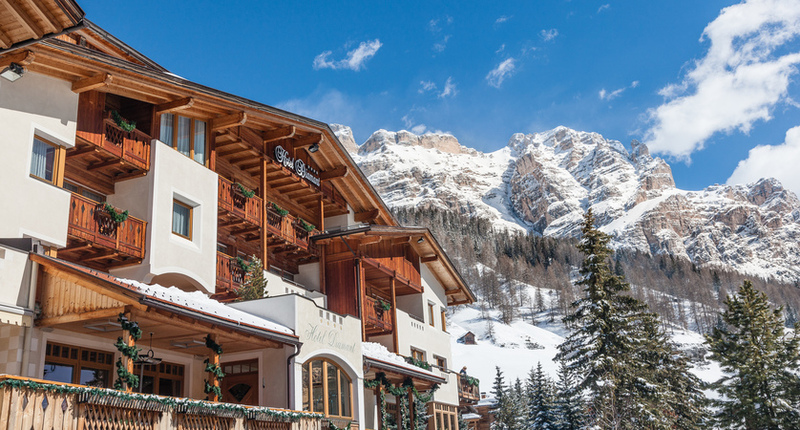 San Cassiano is popular with Italian and British skiers alike, so you will find a particularly good selection of gourmet restaurants on the mountain, as well as simpler, traditional pit-stops. Hug’s Bar and Da La Vedla provide some of the best après-ski in the village, with the Las Vegas Lodge on the mountain providing a lively atmosphere for a final stop-off on the last run home. Overall there is a great deal to discover and enjoy in this latest and very welcome addition to our Italian range of resorts. Beginners will find the best selection of blue runs in the Superski area at the top of the Piz Sorega gondola with perfectly groomed and wide sweeping pistes with plenty of space to practise and develop those important skills. Intermediates are spoiled for choice here, with a mix of reds and blues to explore between San Cassiano itself and neighbouring La Villa and Corvara, even before using the Superski links to other parts of this huge ski arena. Connect via Corvara to ski the renowned Sella Ronda circuit, which makes a memorable highlight to any holiday. Advanced skiers meanwhile will relish the chance to put plenty of miles beneath their skis, as well as the challenge of taking on the famous Gran Risa World Cup Downhill – a black run down into La Villa, which will test the best. Snowboarders can head for ‘Snow Park Alta Badia ‘at the top of the Capanna Nera chair on the Piz Sorega plateau. The La Stua is a well run, comfortable and attractive South Tyrolean style hotel in the centre of San Cassiano. One of the first hotels to be opened in San Cassiano, and now one of its most prestigious, the Hotel Diamant offers an impressive wellness area alongside smart, contemporary rooms and suites. A high quality, traditionally styled hotel in an ideal location, we’re sure that the Hotel Fanes will soon become one of those places that our guests return to year after year. Small and refined hotel in contemporary mountain style. 500m from both the Piz Sorega gondola and the centre of resort.